By painting his “Hoot Owl” in orange colors, I think my father, artist John H. Stermer, was having fun and peaking our curiosity. I see stoic owls, teaming with energy as they wait for the night’s hunt. What do you see? I remember when my Dad painted his owls, titled “Hoot Owl”. The owls were recently purchased and reside in a new collectors home. I was talking to my Mother, Lucianna, about the painting and thought I would share my remembrances. 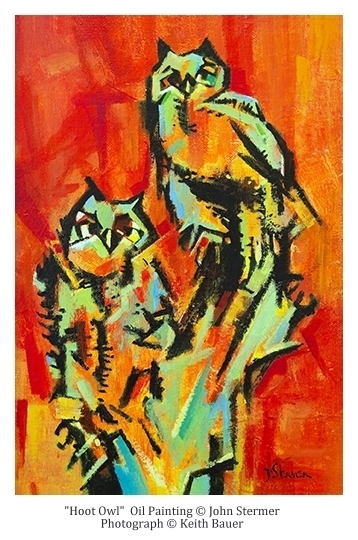 At the time when Dad painted the owls I was studying zoology at Western New Mexico University (WNMU) in Silver City, NM. I remember talking about animals and biology when we would go out on evening walks. Some evenings we would hear owls in the neighborhood. I also remember that my Dad had conversations with WNMU’s ornithology professor Dr. Dale A. Zimmerman. 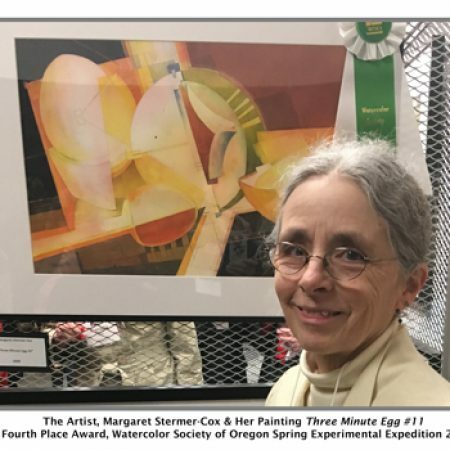 Dr. Zimmerman shared a common interest with Dad: painting. He was painting bird illustrations for field guides. I imagine that Dr. Zimmerman and Dad talked about birds in addition to conversing watercolor painting. Another event occurred about the same time that the owls were painted. Dad’s friends Vincent Malta (Instructor Emeritus, The Arts Student’s League, New York, NY) and Richard “Doc” Bove’ (Instructor Emeritus, Pratt Institute, New York, NY) were visiting. Dad, Doc and Vincent were each conducting workshops in Silver City. I remember having a conversation about how one might paint birds and animals in a fresh and exciting way. What exactly inspired Dad to create the owl paintings I do not know. I imagine it was a convergence of events; conversations and nights spent listening to owls. I figure Dr. Zimmerman, Doc Bove’, Vincent Malta and I all contributed in some way. I can see my Dad’s eye’s light up when he thought he had a good idea, and imagine the same with the owls. I do remember him being excited about the painting and pleased with the results. And, the result was a painting with what I think of as an unusual color choice for a painting about owls. What is the story behind the orange in the owl? This is a question I’ve asked myself. My father was acutely aware of the artistic possibilities of color. Being a classically trained painter, this was important to him. He knew of the symbolic meanings associated with different colors. Orange is a warm color associated with activity, happiness, energy, sunshine, tropics, and deserts for example. Since owls are often a symbol of intelligence, perhaps the orange color alludes to the intellectual powers of the bird. I can imagine the owls sitting on a bush or pine tree branch and scanning their environment during the day. The owls observe and remember the movements of every mouse in the area. Stoically, they wait for nightfall and hunt time to begin. There is energy behind the silent stare of the owl. Sometimes my Father would purposely do something in a painting to surprise the viewer. When I think of owls, for instance, I think of nighttime, dark forests and cool woods. I think of black, blues, greens, and violets. I think of quiet muted tones. By using a strong orange, I am surprised. I stop and ask “why; what are the owls doing that would make them orange”? Another possibility is that orange was used because it makes the blue and green look good. My father routinely used complimentary or near complimentary colors in his paintings. Complimentary colors, being opposites on the color wheel, make each other “sing” and vibrate optically. Perhaps the blue and green of the owls were what was important to Dad. He used the orange to make the colors glow. What is the meaning? I think of these owls as New Mexico desert inhabitants; does the orange allude to environment? Or, is the orange used symbolically – referring to the owl as symbol of intellectual power. Could it be that orange was used just to make the blue look good? Or…? I like to think that my Dad considered all of the properties of color and would have used orange for some or all the reasons listed. With a twinkle in his eyes, he would have loved the orange. He would have been curious to learn what you see in the owls and how the color affects you. Mostly, I think he would be happy that you enjoy the painting too. + The photograph of “Hoot Owl” was done by photographer Keith Bauer. + Copyright of the photograph is Keith Bauer; used with permission. 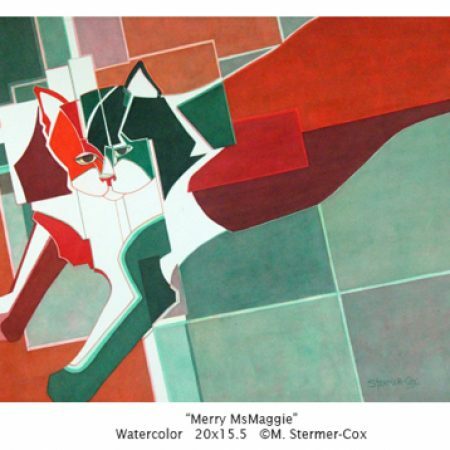 + Copyright of the painting is John H. Stermer Estate/Stermer Art LLC; used with permission. + The painting “Hoot Owl” is in a private collection. +For more about Keith Bauer, I invite you to see his website http://keithbauer.smugmug.com. 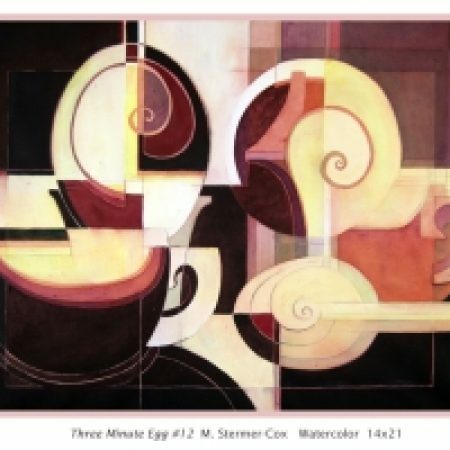 +For More about artist John H. Stermer, I invite please see his website http://johnstermer.com. Very nice story, Margaret; two things jumped to mind when you asked your questions. First that the artist is always in the painting, and second that the color orange in this painting feels very natural to me, reminiscent of desert air and sunshine. If I were to color desert air, I’d likely choose orange. He’s given greens and blues to the living things in the painting and orange to the energy of the place, the air and sunlight surrounding. It’s a lovely painting! Thank you Sandra for your thoughtful insights! I think my Father would enjoy your comments and be pleased! I made it to your new blog site! Yay! This direction you have taken of late is just fabulous. I love your story telling and hearing about your relationship to your dad and his relationship to art. So many levels here that add such depth and distinction to your art as well. I simply LOVE this painting of owls. The orange is beautiful. I did not realize owls memorize their prey’s movements. That is fascinating. I suspect your dad did attribute the color orange to the owl’s intelligence. I really enjoyed your analysis and can see you studying these works of art and trying to discern the meaning behind them. I see your careful consideration in your own art. Your art is distinctly you, influenced by your dad but so different too. Wow Peggy! You’ve taken a huge leap forward. I need to read back through your other entries. OMG Pam, I just imagined that the owls were memorizing their prey’s movements. OOOPS; its just the odd way I think and imagine! Though, owls being owls, perhaps they do remember movements…? I hadn’t realized that you had yet to see my new blog. I am a little bit behind on letting people know I changed address. I wanted to make sure this version didn’t crash! I had an earlier version that crashed and burned. My husband had to rebuild it. There was something wrong with how it was transferred from servers. He was trying something and it didn’t work. I think this one will be fine. Thank you for the compliments! I just have to keep it up! Peggy- I’m going with they do memorize their prey’s movements! My cats certainly do and owls are probably smarter. What a terrific painting, Peggy, and I see your Dad’s influence on your work. 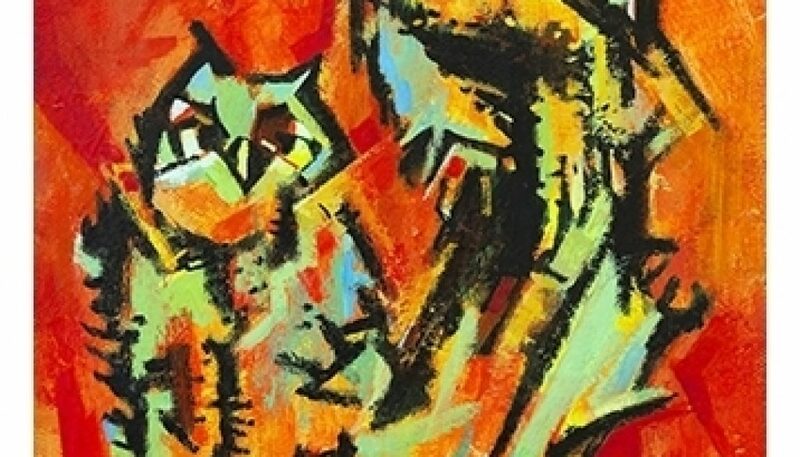 He certainly was a very accomplished artist, and it appears that people continue to collect his art. I love your memories and they give so much meaning to the work. Great blog! Thank you Mary and thank you for the compliment! I naturally have strong feelings about my Dad’s paintings and those feelings helped shape my own ideas. It’s fun sharing my story about Dad’s work and I’m glad you enjoyed it! Hi Zjanart! You studied with Doc Bové – how wonderful! I thoroughly enjoyed taking a workshop from him way back when. Again, thank you!